Gold faces dual challenge from strong dollar, fading safety demand. Next few days will seriously test gold's important 120-day trend line. Gold's longer-term safety bid should remain intact, however. Gold is facing its toughest test since its recovery began last October. After having to fight the headwind created by a resurgent U.S. dollar in the last two months, gold’s safety factor is now being undermined as traders start to embrace risk once again. In today’s report, however, I’ll make the case that it’s still too early to count gold out and that the yellow metal will eventually overcome the latest challenge to its longer-term bull market. As last week showed, investors are gradually beginning to shed their aversion to risk with the latest corporate earnings season now underway. Last Friday saw the release of a few major earnings, including Dow 30 components JPMorgan Chase (JPM) and Wells Fargo Co. (WFC), both of which beat earnings expectations. Analyst expectations for first-quarter earnings were extremely low heading into the latest reporting season, so any surprise earnings beats will likely have a positive impact on stock prices in the next couple of weeks. It should be pointed out that there have been plenty of times in the recent past in which gold and stocks have been able to move higher in unison. That said, with investors beginning to embrace a “risk on” approach to the markets, gold will have an additional obstacle in its path as a growing number of companies report positive earnings. Heading into April, gold still enjoyed a measure of safe-haven demand even while its currency component was weaker due to a strong U.S. dollar. Now the gold price is faced with the temporary loss of even the safety bid. Assuming U.S. economic news continues to impress while earnings exceed Wall Street’s low expectations, gold could well face its biggest challenge since last November. From a technical perspective, one of gold’s most important long-term trend lines which has historically supported the metal’s price during bull markets is the 120-day moving average. To date, this trend line remains intact and hasn’t been violated since last year when gold’s turnaround first began. The rising 120-day MA confirms that gold’s longer-term price momentum is rising, which in itself provides a measure of support for prices during periods of weakness. As long as the 120-day MA remains intact on a weekly closing basis, gold’s 7-month bull market should be considered to be intact from strictly a technical perspective. Gold’s currency component, meanwhile, remains somewhat weak as previously discussed. However, the U.S. dollar index is at an important juncture and the next few days could easily determine gold’s next short-term directional move. Shown here is the Invesco DB USD Bullish ETF (UUP), which illustrates the pivotal 4-month high the dollar index is now testing. If UUP breaks out decisive above the $26.00 level this week and closes at a near 52-week high, it will put serious pressure on the gold price by weakening its currency component even further. It wouldn’t necessarily mean the end of gold’s longer-term bull market, but an upside breakout in the dollar index would definitely create a major headwind for the metal in the immediate term. It’s not a sure thing that the dollar will break out of its 4-month trading range, however. As the above graph of the UUP shows, the dollar-tracking ETF closed last week above its widely watched 50-day moving average (blue line), which confirms the dollar’s intermediate-term rising trend. Yet, UUP also closed below its 15-day moving average on a weekly basis for the first time since last month. This calls the dollar’s immediate-term (1-4 week) trend into question and could serve as a catalyst for some downside pressure in the greenback this week. 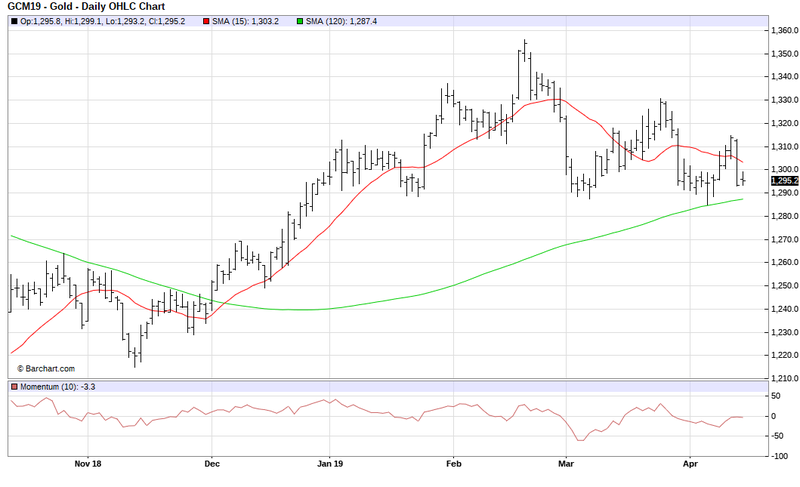 Weakness in the dollar would give gold some much-needed breathing room and allow the metal’s price to put some more distance between it and the 120-day moving average. You can see here why gold faces a key challenge in the next few trading sessions. Despite the fading of investors’ risk aversion and the latest challenge to gold’s recovery, it’s not all sunshine and lollipops in the global economy and gold isn’t without allies. Gold’s safety bid hasn’t completely evaporated, and once the latest sugar high from positive corporate earnings and economic reports has subsided, the odds are high there will be a recrudescence of the very same fears over the fragility of the global economy that have plagued investors for over a year. This has, after all, been a recurring pattern since gold’s turnaround first got underway last October. With no formal resolution to global trade worries yet, the fear of the unknown will ultimately continue to provide a safety bid under gold. Turning our attention to my favorite gold tracking vehicle, let’s take a look at the iShares Gold Trust (IAU). 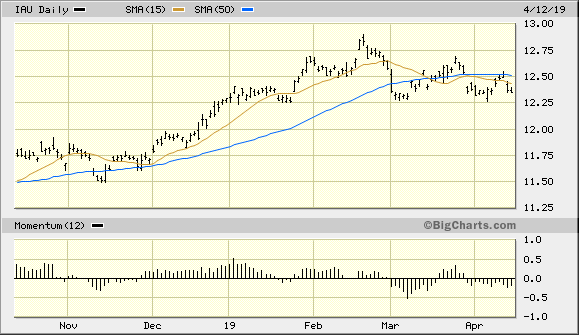 The IAU price rose conspicuously above its 15-day moving average on Apr. 9, which was the first such time this has occurred in several weeks. However, the gold ETF’s latest attempt at establishing a buy signal was never confirmed since the breakout was reversed on the Apr. 11 session when IAU fell below the $12.48 level, the initial close above the 15-day moving average. Therefore, we’re still in a cash position and we’re still waiting for a confirmed buy signal for IAU. 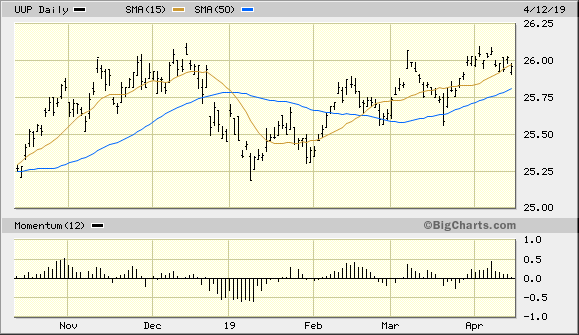 The above graph shows that IAU finished the latest week below its 15-day and 50-day moving averages. While this doesn’t necessarily mean that IAU’s price will decline from here, it does mean that the gold ETF is still vulnerable to selling pressure as long as it remains under the key $12.50 level. It’s a reasonable guess that quite a few short sellers have set their protective stops around the $12.50 level due to the presence of the popular 50-day MA. Getting above this price level would put IAU back above both moving averages and likely also trigger some short covering. Once the “sugar rush” of the latest round of positive U.S. economic news has subsided, gold should see a revival of its safety-related demand. This is especially likely in view of the fact that uncertainties over the state of the eurozone and the global economy haven’t yet dissipated. For now, however, we don’t yet have a renewed short-term buy signal for gold based on the rules of my trading discipline. Moreover, only if the dollar breaks out decisively to a new 52-week high and continues to rise on a sustained basis would I be forced to re-evaluate my bullish intermediate-term (3-9 month) gold outlook. On a strategic note, investors are justified in maintaining intermediate-term long positions in gold based on the prevailing fundamental and psychological factors discussed in this report. Short-term gold ETF traders, however, are still on the sidelines and should wait for the gold price to confirm its latest breakout before initiating new long positions.